I have been painting most of the day and am quite happy with the progress so far. 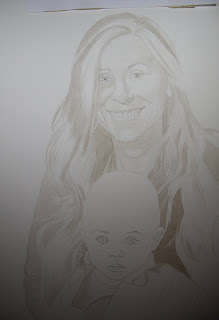 I have laid down some of the darker values and done a fair bit of negative painting in the mother's hair. She has such amazing hair, I could spend days just painting her hair! Her facial features are starting to take shape as well and will take a break from her to ensure the paper is completely dry before continuing on her face. It is really nice working this size and I think it is the perfect size for a double portrait as you can really get in and add the details. The baby's clothes have been blocked in and I will start building up his face to the same level as his mother's and then I will start to remove some of the graphite prior to continuing to model their features further.